Try out functionality live while reading about it, in the tutorial document that loads up when you first start the program (or press F1). Start by creating a new grid (menu File/New, or CTRL+N). Don't worry too much about dimensions, inserting/deleting rows and columns is the easiest thing. Once you start typing on a selected cell, a thinner border will indicate that you are in text edit mode (similar to spreadsheets). This intuititively works much like a text editor, try it out. Don't worry about accidental deletions, there's unlimited undo on any actions (Edit/Undo or CTRL+Z). Saving (File/Save or CTRL+S, File/Save As) and Loading (File/Open or CTRL+O) work as you expect from any productivity application. TreeSheets automatically loads the last saved .cts file on startup. Use File/Export As XML / HTML / Text if you need to use your data outside of TreeSheets. Every click of the MouseWheel will zoom you in one level, so even very deeply nested grids are instantly reachable with a quick flick of the MouseWheel. 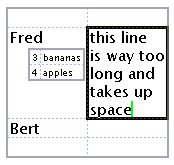 And since text sizes are relative, the root of what is currently displayed will always be the default font size, making it readable and editable. This system allows you to create TreeSheets containing huge amounts of data, where only the overal structure is visible at the root level, yet everything is quickly within reach. Zooming out back to the root is even easier since it doesn't even require a selection: just flick your MouseWheel in the backwards direction. (Any use of the MouseWheel can be replaced with PageUp/PageDown, which may be more convenient on laptops). TreeSheets will show scrollbars when the current data doesn't fit on screen, but you are encouraged to find out how much easier it is to work without scrollbars, by shrinking items till they fit. You can shrink unimportant text down to single pixels (!) which is then only readably by zooming in. Cut (Edit/Cut or CTRL+X), Copy (Edit/Copy or CTRL+C) and Paste (Edit/Paste or CTRL+V) work as you expect, though the destination for Paste is expected to be a single cell. Copy and Paste works too and from other applications as well, with any selection being converted to lines of text, with indentation indicating hierarchy levels. Similarly, if you have any text that uses indentention for hierarchy, pasting it into TreeSheets will reproduce that structure. You can add images to any cell (Edit/Images...). The image will be conveniently stored as part of the file. Once you have loaded an image into a cell once, you can copy paste it to any number of cells within the sheet. Images are always rendered in front of any text that is also part of the cell (and above any subgrid), if you want a different orientation, simply put text and images in seperate cells.